The Snow Sprite palette was the one I was most iffy about... Light greens and blues, colors I have a really hard time pulling off because they make my face look so red. Though, after wearing the blue side, I'm really happy I decided to get this. It's so nice. The packaging. So pretty. Taking a picture at a weird angle helps keep the glare off the plastic and for some reason picks up more of the shimmer in the shadows. Inside the palette. 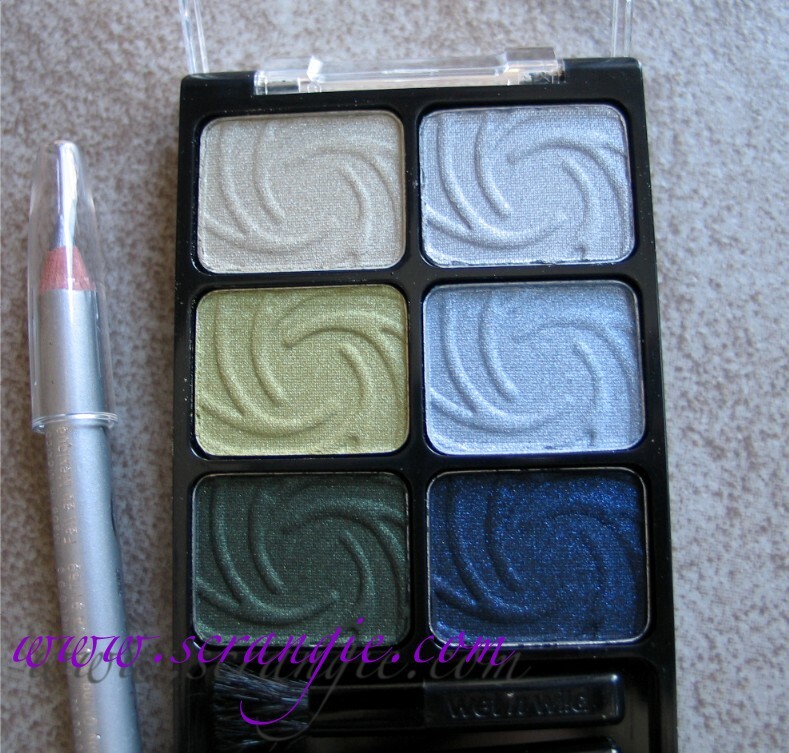 A dirty creme pearl color with slight green tinge, a surprisingly awesome spring green with duochrome, a black with green shimmer, a blue-toned silver, a light metallic blue and a black with blue shimmer. Comes with a silver eyeliner pencil. Check out the shimmer in the dark shades. You might be able to see some of the weird color mix in that light green color if you enlarge the photo. Slightly different lights and angles. See how the second color seems to shift from a funky yellow to green to a slight orange sheen? Did not expect that. Thought it would just be a yellowy-mint color. The eyeliner applies as more of a metallic grey than a true silver and it wasn't as smooth as the black shade from Night Elf. The blurry one is the only one that shows the glitter I added. It was more sparkly in person. Still haven't quite mastered the art of photographing eyeshadow with glitter. At least this time I still had a little daylight so I didn't have to use flash on all of the pictures. But, really, can you tell that there's blue in there? Other than the blues not looking blue once I applied them and some pretty heavy fallout on the black shadow, everything about the palette was great. 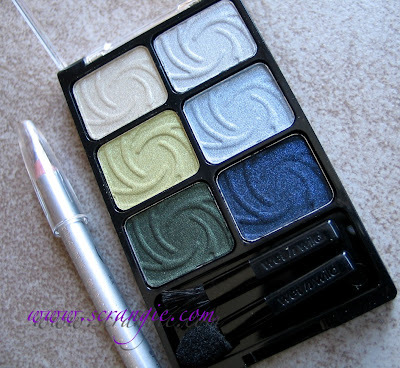 All the colors are silky and dense and shockingly pigmented. 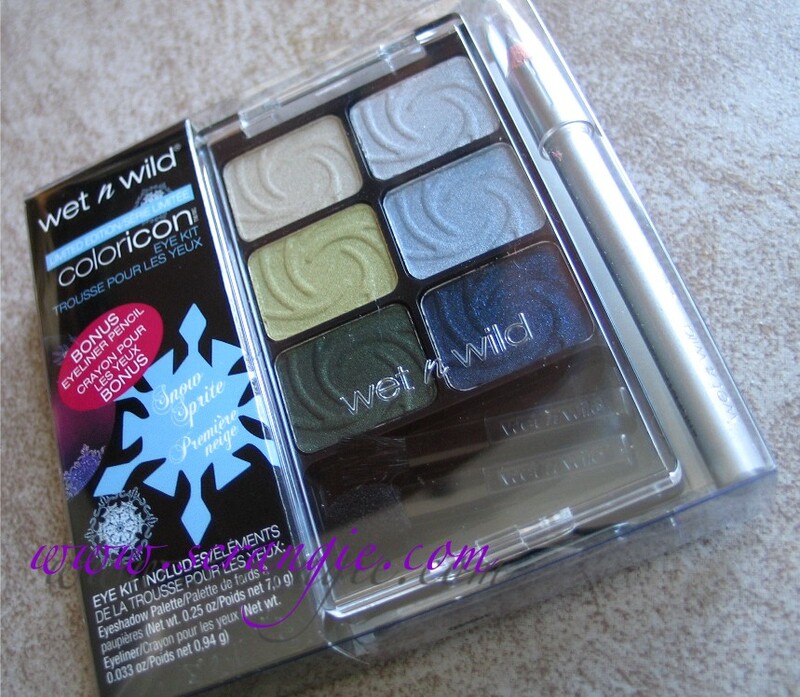 When did Wet n Wild become so awesome?! What have I been missing? These applied and blended flawlessly, nothing at all like the sheer chalky Wet n Wild shadows of my youth! Totally love these palettes. Can't believe they're only $5. Blows my mind. I think I'll post the incredible Golden Goddess one next. Absolutely gorgeous! I ADORE silvers/grays with brown eyes. And your application - wowza! If you don't mind sharing, what brushes do you use and recommend to get such fantastic blending?? Please do post the Golden Goddess one! I love this palette. I have this one, and Night Elf. Usually I never buy drugstore e/s, but WnW has totally changed that for me! I love the green side a little more than the blue side--that palest green shade is killer! I love all these makeup posts lately! Apparently earlier this year WnW launched their Color icon line of shadows. There are 4 new palettes in their core line, too, not just these LE holiday ones, plus single ones and ones with 3 colors. I'm so suprised at these shadows. They used to be such a crap brand. Love the silvery blue on you. Wow I really like this palette... I should get it :) Nice look! Man, I haven't been able to find these Holiday palettes anywhere. Our local Rite Aids are hit or miss and there's no Walgreens near by at all. I am an unhappy elf. I agree that the colors don't really look blue, but they are certainly beautiful. Nice eye looks! I'm STILL waiting for these to show up by me! So pretty! 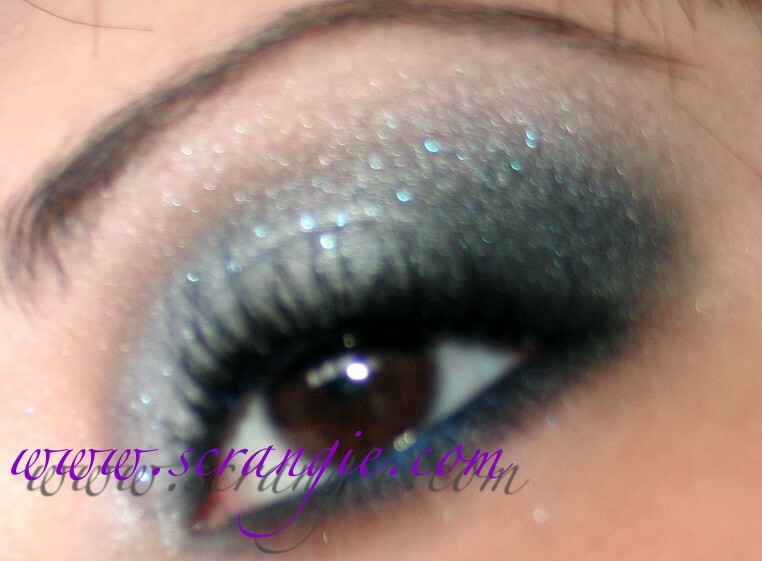 I love this smokey eye look!